Martini Cartwheels: Can You Box That Up Please? You know, the fun doesn't have to end when the meal is over. 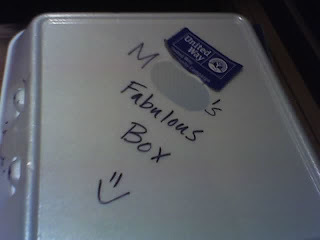 Next time you are out with your girlfriends, spice up the evening by adding some artwork to your buddie's box. Leftover box that is. After a few drinks, you will be amazed at the talent displayed by your friends when it comes to artwork and limericks. So don't be shy! Grab a marker and get to it! What other kind of box could you ever be suggesting? LOL! 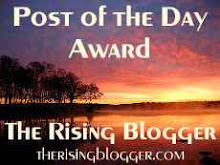 Is that what I saw in Anne & Laura's fridge Saturday? Yes Cristina, in fact they had the censored box. Not their fault though, someone else did the art work. It wasn't me however. It was some other dirty girl. I stuck to limericks. Yeeaahhh, hmmmm, I've been out with all'ya'all. I'd probably say no one was too innocent. 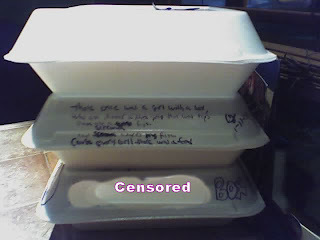 My friends would write things that would prevent me from ever taking my left overs to work the next day! I would have to watch where I put them in my fridge or my kids would learn new colorful words! Hi Wendy - I think we horrified the waitress. I can't imagine what co-workers would think!